Santa Monica has just unveiled its new plan to redesign the city. Not a massive building. Not a revamped downtown. But rather, bus stops would serve as a flexible branding for the city itself, becoming everpresent in 360 bus stops around town. 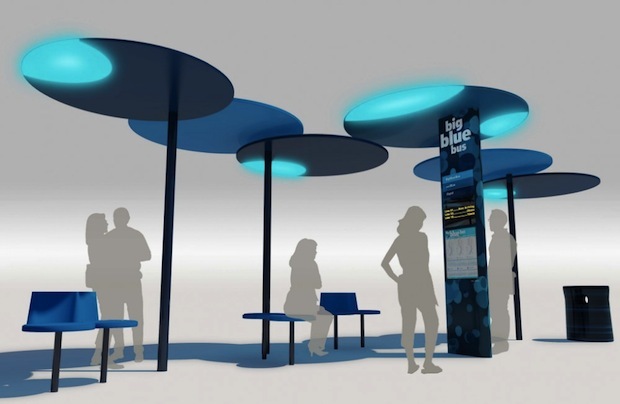 The so-called Big Blue Bus architectural and branding package was first announced in June, when it was awarded to Lorcan O’Herlihy Architects and Bruce Mau Design. Last Tuesday, the Santa Monica city council approved LOHA’s design of the bus shelters and BMD’s wordmark. Today, the first images have been revealed. The stops themselves certainly aren’t quiet, and they’re different from the open-faced sheds you’ll find in most cities. Since rain isn’t really a big problem in Santa Monica, the designers focused on sunlight, which renders most designs into solar cookers in the mornings and late afternoons. The canopies won’t have a single arrangement. Rather, they’re a kit that can be reconfigured to each street corner, to maximize shade depending on where the sun falls. So for example, the cloverleafs might arranged in a diagonal or horizontal orientation, on different roads and corners. The city is aiming to have the first stops in place by year’s end.